Date: 5 June 2018. 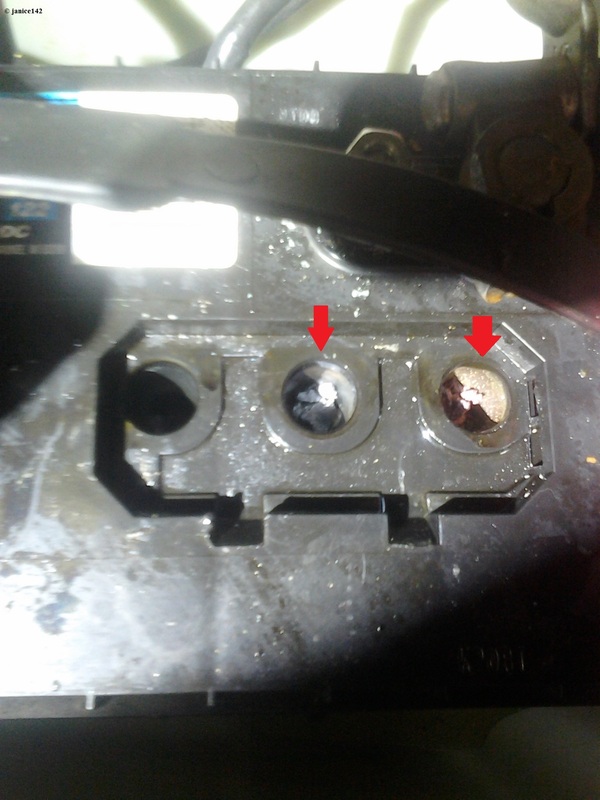 Diagnosing a Bad Battery. A neighbor has a boat that would not start. Because the engine turned over weakly, he believed the batteries needed charging. Fortunately shore power is available. Thus it was a simple matter to charge the battery banks. Nevertheless there was a problem. Here's how I diagnosed where the issue emanated. The black batteries are 8 volts each. ↑ These are the dead ones. After 24 hours of charging, the engines still would not start. Details: These are two 871's, Detroit diesels, naturally aspirated. Each engine has a 32 volt battery bank. For the curious, that means four batteries, 8 volts each wired in series. Please note regarding the preceding paragraph that I am parroting what has been told to me. Real mechanics will understand. I am not qualified to provide more than a cursory explanation at this point. There are two ways to wire batteries in a boat, either in Parallel or in Series. Larger boats generally have bigger engines. Tug boats have powerful engines. 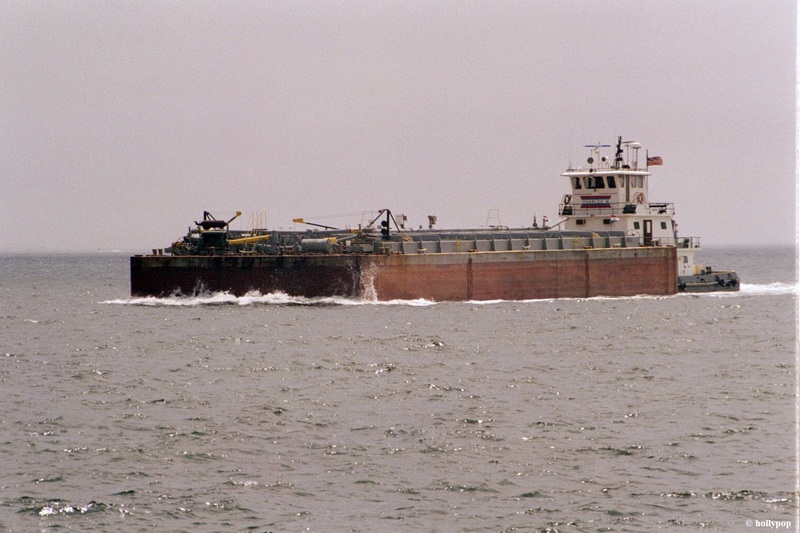 This is the tugboat Charles M ↑ pushing a barge off Pensacola, Florida. No doubt the Charles M has big engines. After leaving on the charger for 24 hours we again tried to start the engines. Neither turned over. The first task was the verify the battery charger was working. To do that I took a multi-meter down into the bilges. These are 8 volt batteries wired in series. That means that the positive terminal of one batt is connected to the ground of the next. Done four times, and voila: a 32 volt battery bank. Side Note: I should have verified the charger was working PRIOR to leaving it on for 24 hours. I drew a sketch of the batteries and where the wires belonged. How to test that the Charger is charging: On a battery bank wired in series (positive to ground, versus positive to positive) you place one lead from the multi-meter on a positive terminal and the second lead on any ground in that bank. This will tell you how much power the charger is putting into the batteries. For a 32 volt system the number should read 36 volts. That's what I saw. I checked both the port and starboard banks. Both showed the full 36 volts incoming. not enough power even with the battery charger turned on to start the engines. 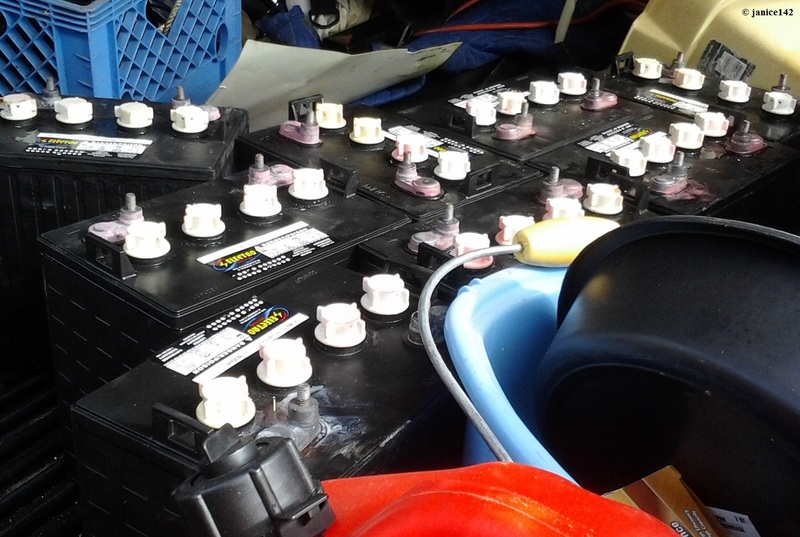 There are several methods for identifying a bad battery. My favorite is easy. 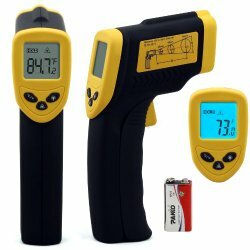 I use an infrared thermometer. This is mine. ↑ I use it far more than anticipated prior to purchase. During charging your batteries heat up. 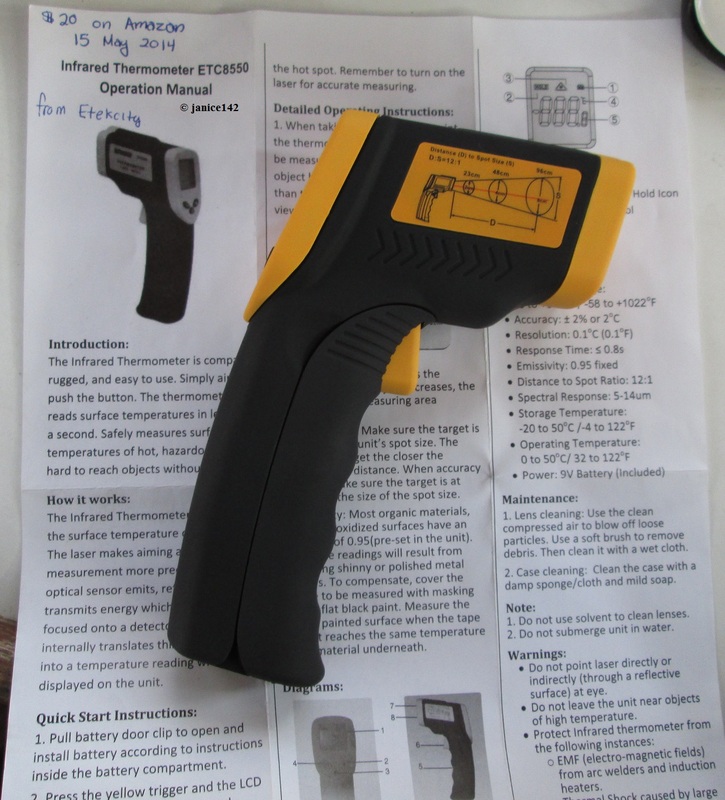 To figure out which battery has a problem point the infrared thermometer at the top of each battery. You are looking for one area that is warmer than the others. That one will have a problem. I bought my meter when I found one for $20. Originally these were $250. That is far too costly for a non-professional. When the price came down to $20, I was right there buying a unit. Frankly I've used mine so much I wonder now how I ever managed without it. 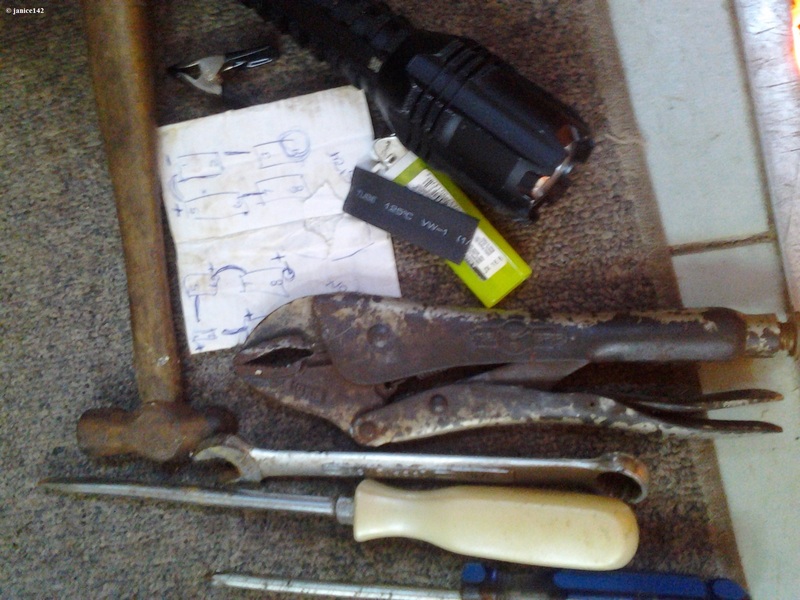 Side note: Take out the 9-volt battery each time you finish using this tool or it will be DOA when you need it. that battery had a swollen top. Then I removed the cover. The BATTERY ACID WAS GONE. That's bad! There should be liquid in the battery. Good maintenance would have spotted this before the battery was ruined. I could clearly see that the inside was damaged. Because the 8-volt batteries were several years old, the boat's owner elected to replace all the batts in both 32-volt banks. Eight batteries in total would be replaced. The first damaged one I slid out of the hole and lifted up from the bilge. Then I discovered that indeed I was too old for that sort of nonsense. Of course I knew that, but this time it was going to be different. Because I'm special. And these are just 8-volts not the bigger 12-volt batteries I have in Seaweed. Hahaha. "Before you take on some big job, full of confidence because you did it before, just remember that you were younger when you did it before." Thomas Sowell. So, I got smarter. And the owner hired the diver Levi to haul 'em out of the bowels of the bilges. Levi was kind enough to take those batteries out. Thank goodness! And thank you again Levi. I couldn't have done it without 'cha. Levi is the newest diver. He comes once a month to scrape boat bottoms. Although hauling batteries out of a bilge and replacing them again later is not his normal line of work, he did so as a favor. That was right nice of him. Now if you're in the St. Pete area, I can say the young man has a good reputation over here. Levi calls, comes when he says, and does do special projects... So far there are three of us on this canal who have hired him to keep the bottoms of our boats clean. He's detailing a vessel nearby later this week. Levi's phone number is 330-689-6652. Leave a text. 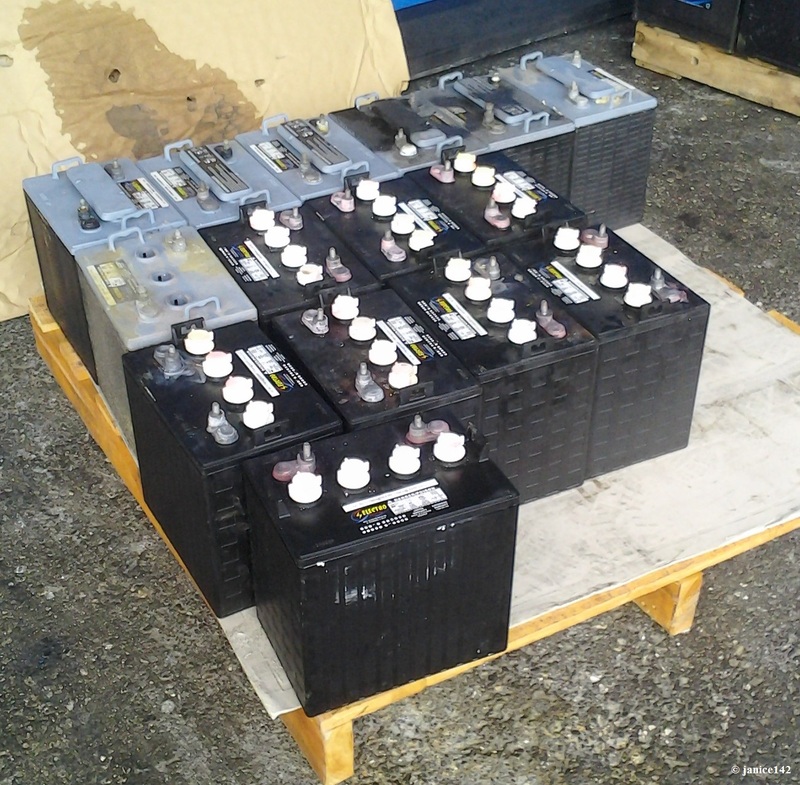 Eight old batteries, in the truck and heading for Electro Battery in St. Pete. So, if you've wondered what I've been doing of late, now you know. More upcoming. On installing the new bank I made mistakes. Those I will write about soon. This was my first time working on a 32-volt system. It was rather fun. I'd love to hear when you decided hauling batteries in and out was a job for youth. And, what battery voltage(s) do you have aboard your boat? A favorite aphorism: My bounce back is more like a THUD. Janice Marois.